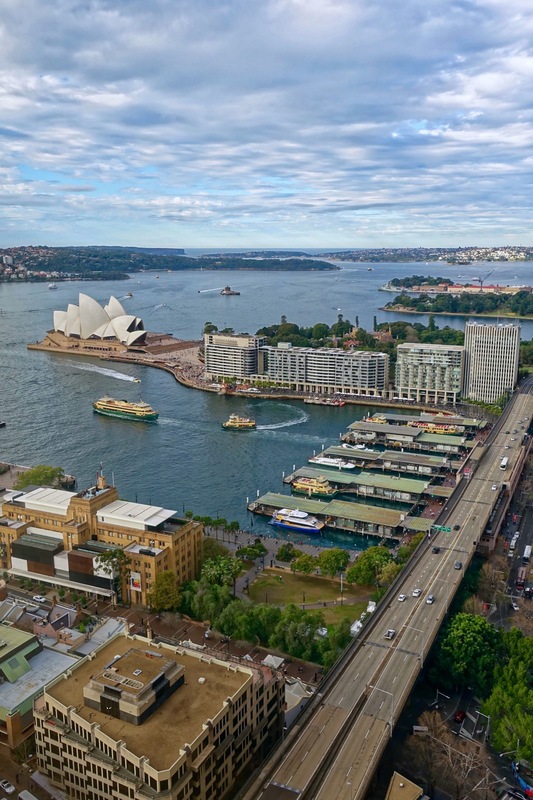 I’ve previously written about American Express Fine Hotels & Resorts as a way to get access to some competitive rates and benefits with stays at a select number of high-end hotels, and with a recent stay at the Shangri-La in Sydney that really showed. 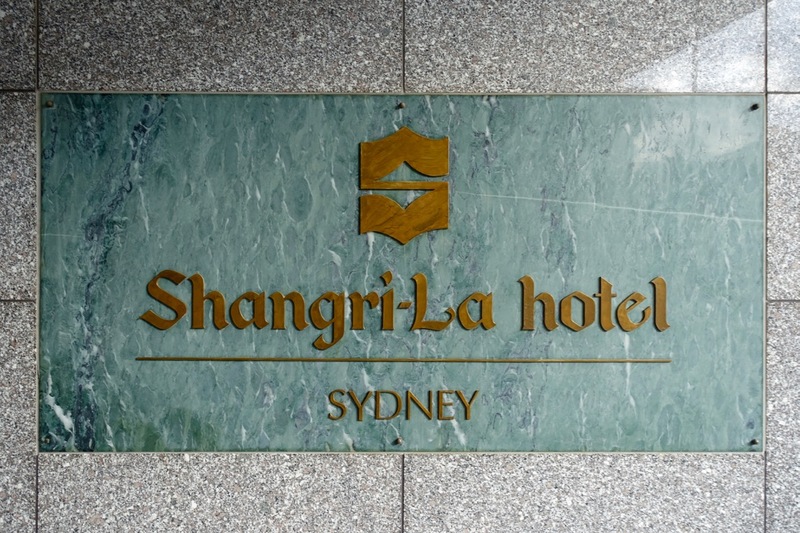 The Shangri-La is not very impressive from the outside. It has a relatively small physical foot-print but leaps up into the sky at 36 stories, one of the highest buildings around it. 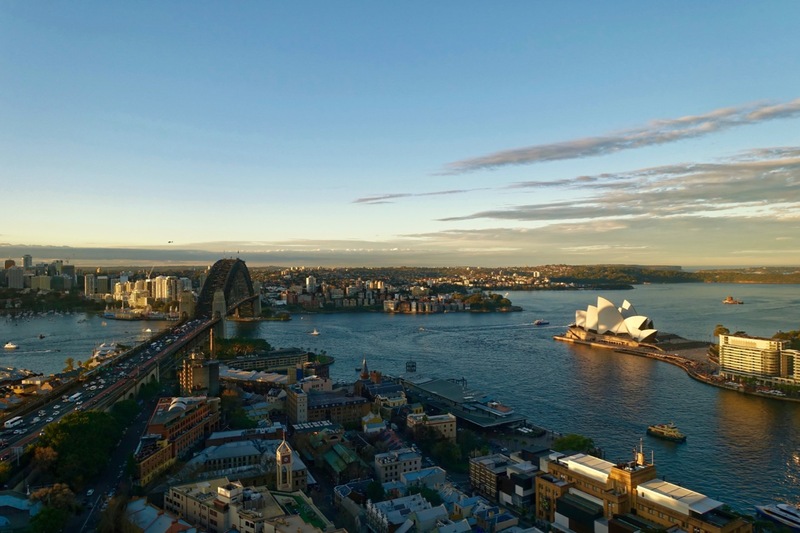 This means that the Shangri-La, somewhat like other Sydney real-estate, is all about the views – and on that front, the hotel definitely didn’t disappoint. Great views in a hotel mean nothing without great service and comfort though, and the Shangri-La had that nailed too. All up, it was a great, well-rounded stay – there’s nothing totally unique about the rooms or property itself, apart from that that view. This was a last minute booking. 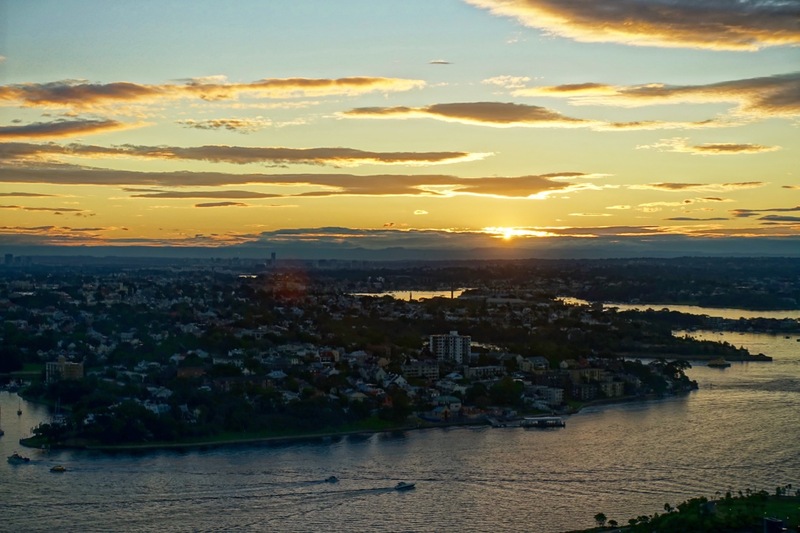 Sydney is my home city but with a busy couple of days on the cards, I figured it would be helpful and fun to have a base in the city, preferably with as early check-in and late check-out as possible. In effect, I was a business traveller in my own CBD for 36 hours. 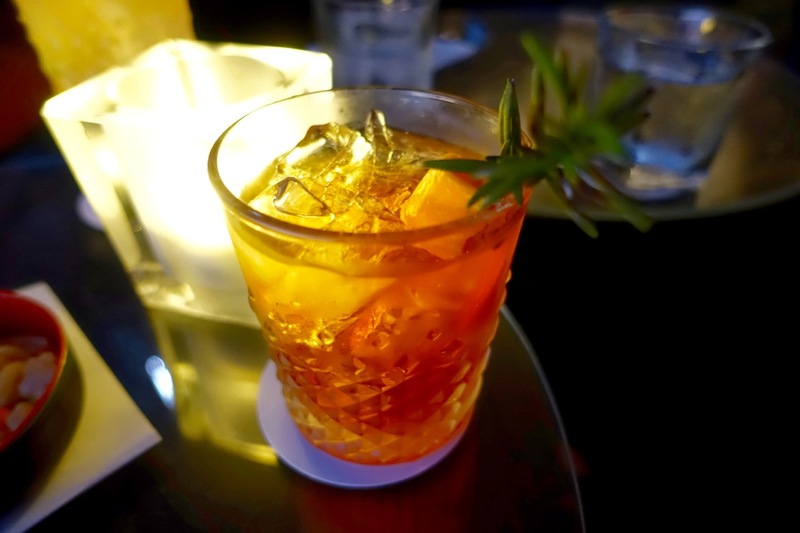 I started looking the night before I needed a reservation, and hadn’t intended to go for the Shangri-La. I gave the Amex Platinum Concierge a call at around 8.30am of the day of the stay and asked them to look at a couple of rates for different hotels, and this one popped up during the search. 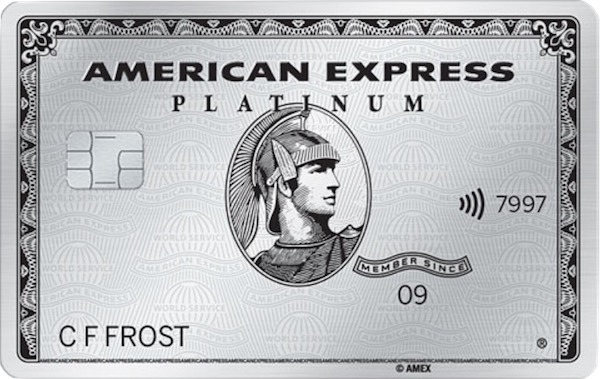 American Express Fine Hotels & Resorts offers unique benefits and rates at select properties. 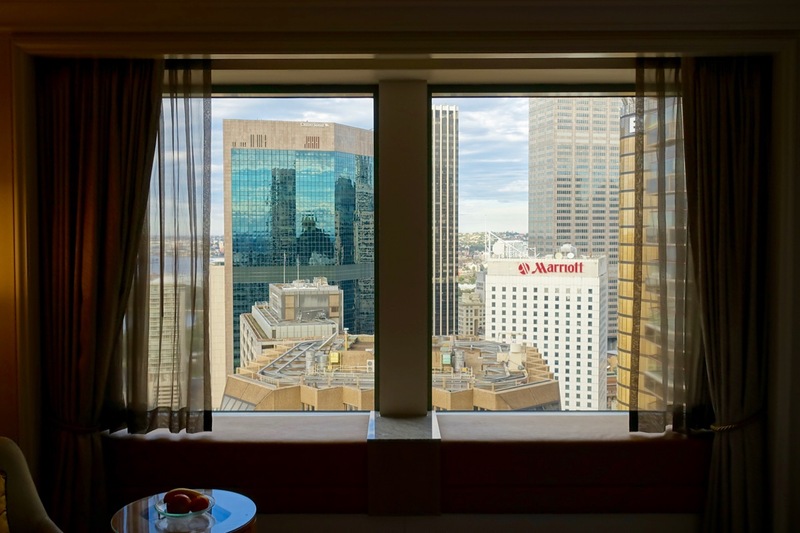 The room on offer via American Express Travel was a Horizon Club City View room at $354 per night. 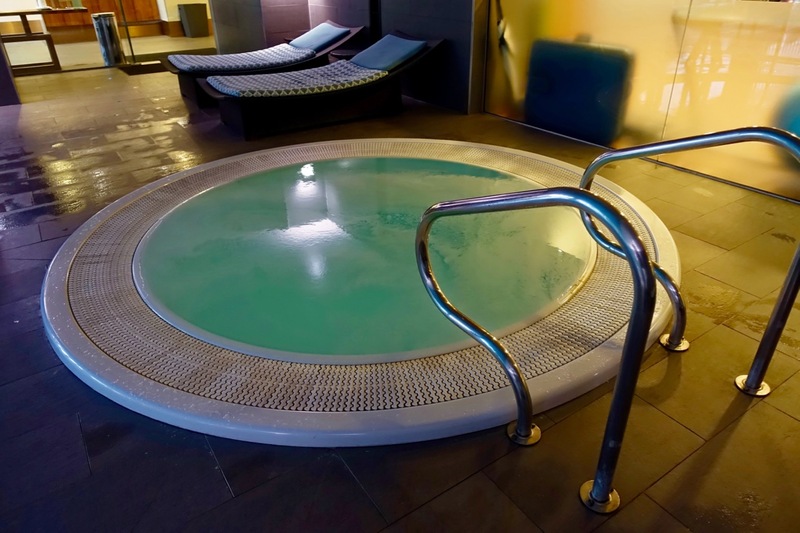 Horizon Club rooms include access to the Horizon Club on level 30 of the hotel, with breakfast, afternoon tea and evening drinks and canapés all included. The best publicly available rate I could find was via the Shangri-La website, at $460 per night. Given the $354 nightly rate via Amex FHR, and I called back and booked it at about 11am, around an hour before I checked in. American Express also offers mid-tier ‘Jade’ status in Shangri-La’s Golden Circle loyalty program, however I hadn’t gotten around to activating my membership yet, so I wouldn’t be getting any extra benefits due to that, although I could earn points which can be transferred to most airline partners. 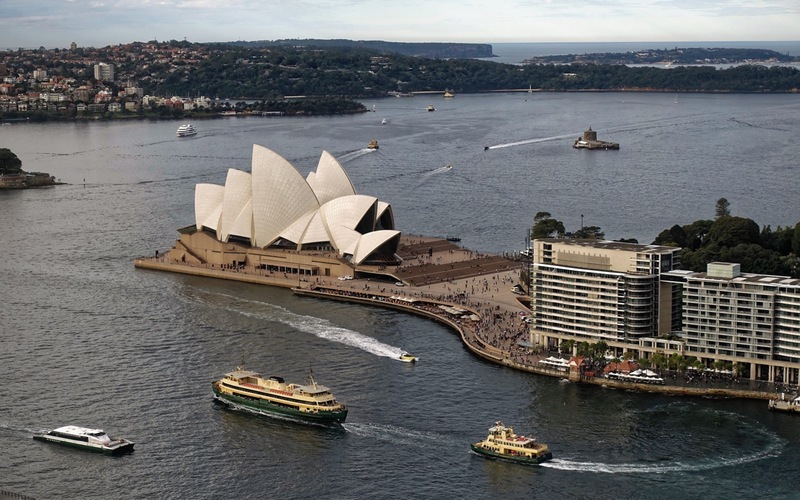 The hotel is located at the edge of The Rocks and Millers Point, next to the main off-ramps from the Harbour Bridge. 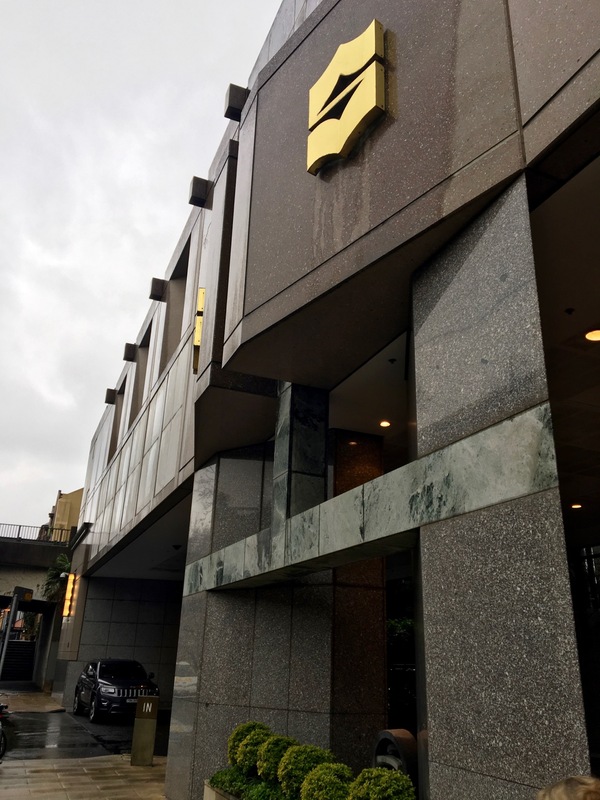 There are two relatively unassuming entrances on Cumberland Street and Gloucester Street. 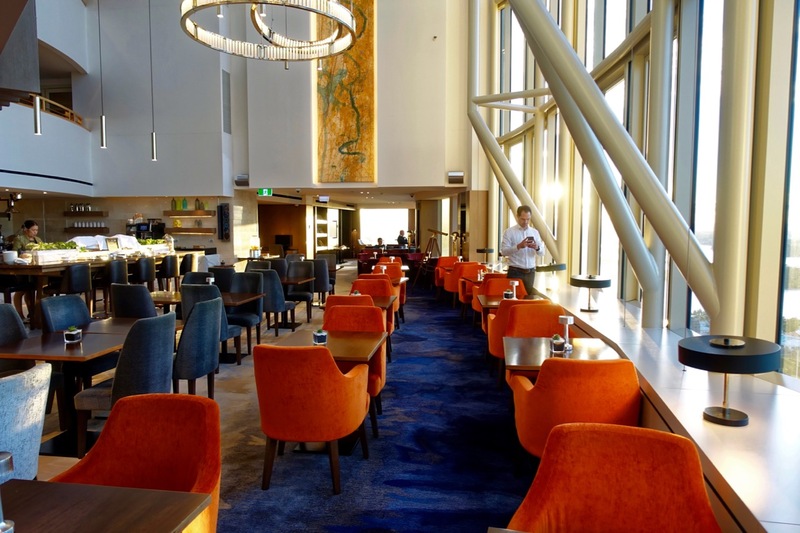 There’s a lobby bar / cafe on the ground floor, a budget and a la carte restaurant on the first floor where most guests take breakfast, also serving an Asian-inspired menu for lunch. 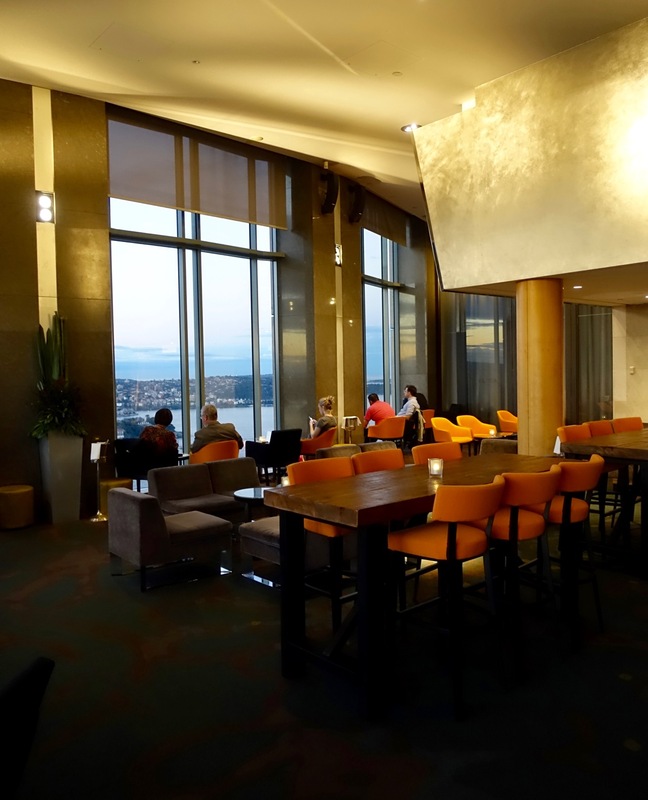 There’s also a bar (Altitude) and fine dining restaurant open to the public on the 36th floor, from both of which the view is astounding. The room was around 28 metres squared according to the Shangri-La website, so not massive. 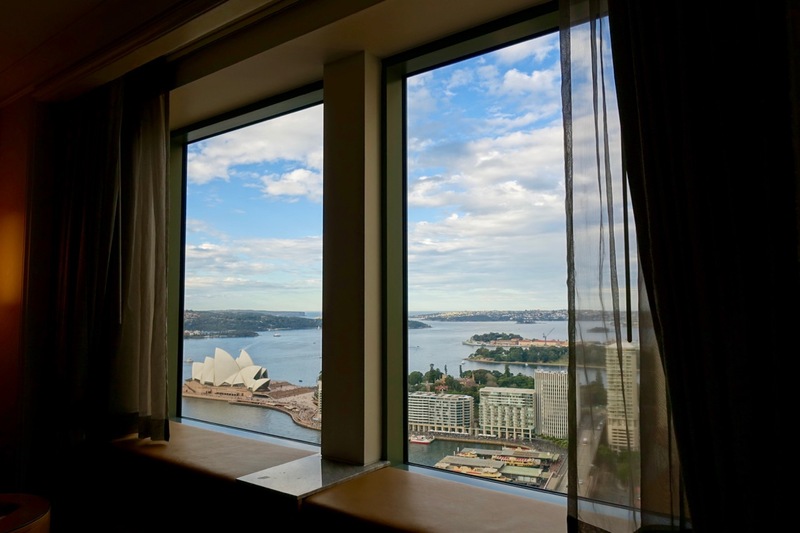 However, as you’d expect with a hotel that’s all about the view, going from a city view to a an Opera House View Room was a massive win for increasing the appeal. 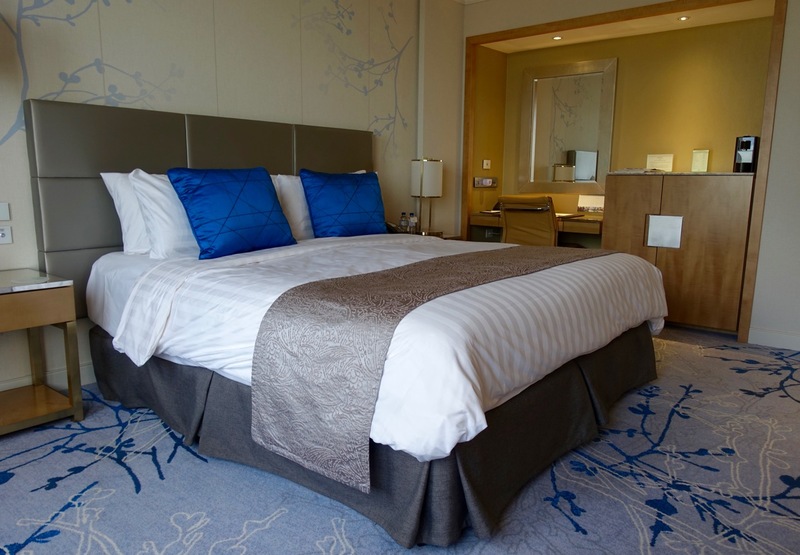 The room is laid out in a standard hotel style – front door, small hallway, bathroom off to one side and main bedroom space, in this with a large comfortable King. From further back in the room, the view wasn’t all that, and the space wasn’t massive – so I was beginning to wonder what the hotel was about. Going back a little, the selling points of this hotel hadn’t yet made themselves clear. I was invited to check in at the Club, when I did, I didn’t have a chance to go beyond the desks in the entry. The Hotel entrance and ground floor Lobby is also nice, but not particularly interesting in any way. So as I walked further into the room, the Shangri-La started to make sense – with a Club room on Level 33 (of 36 floors in the hotel), and a view like this. The window has a wide, deep and comfortable box seat to enjoy the view from. I stole a cushion from the bed and worked here for an hour or two. 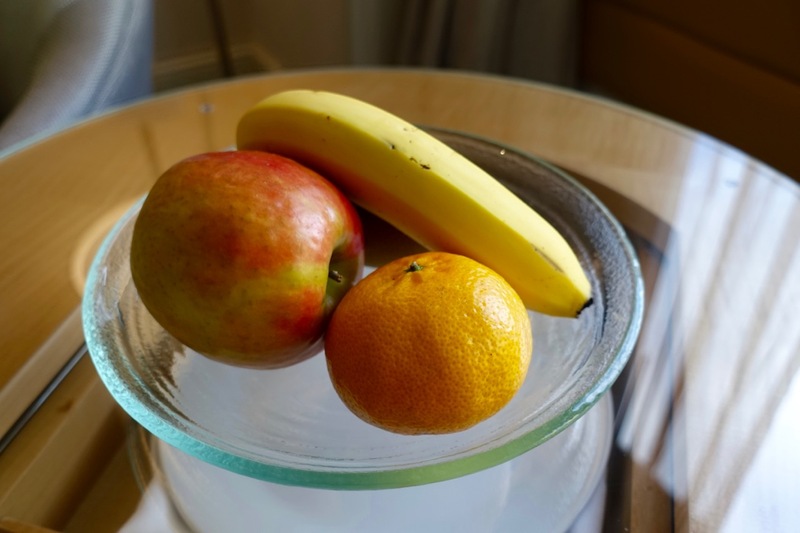 A bowl of fruit was left as a welcome amenity – a nice touch. 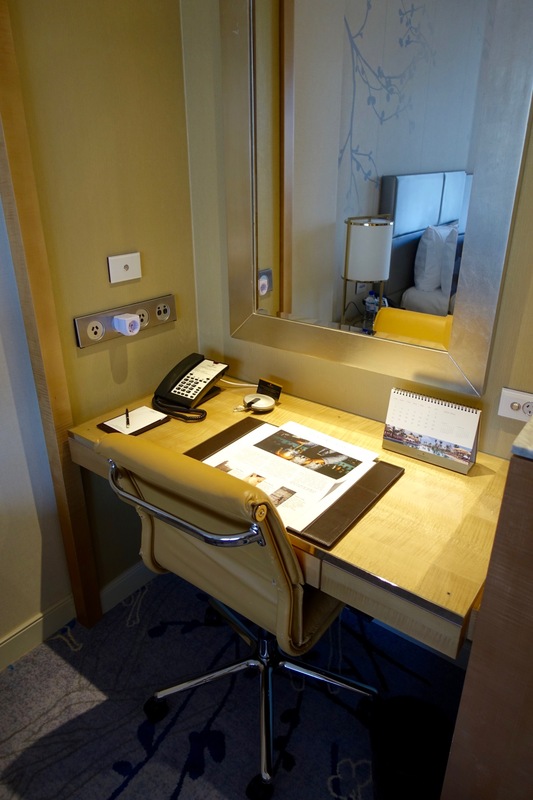 On the other side of the bed is a proper desk and comfortable workspace, a massive plus for those travelling with work to take care of. 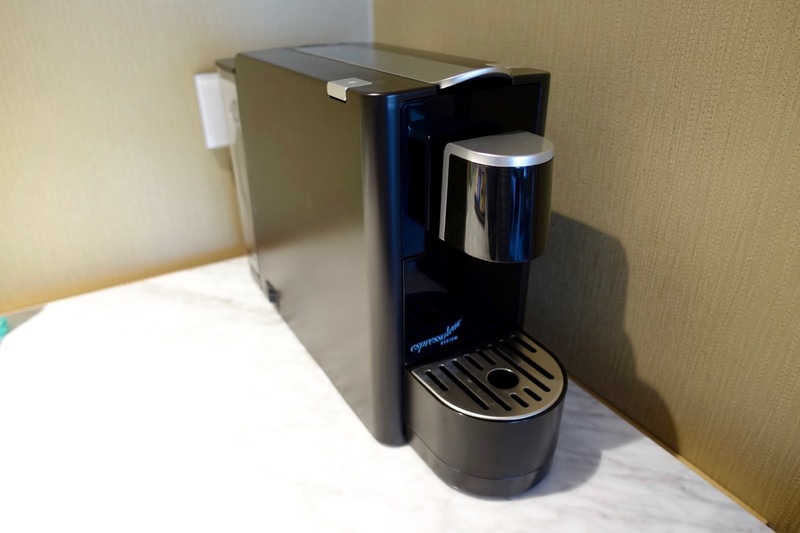 If you’re in need of coffee and can’t stretch to heading to the club on a different floor, then there’s a simple pod machine ready to use. 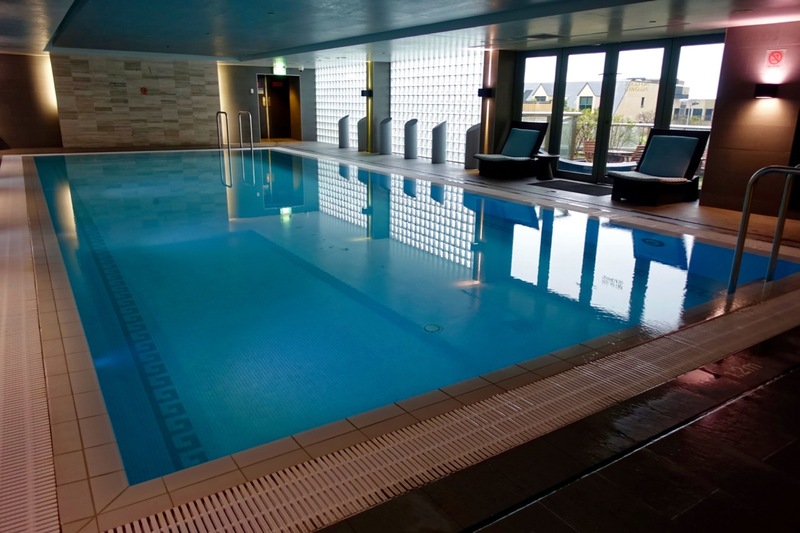 Down on level 3 of the hotel is the pool, spa and gym – there’s a decent size pool, small hot tub, outdoor seating area and fairly well-equipped gym. I’m allergic to gyms so didn’t go in, and was out of time for a swim, but it looked pretty appealing. If you’re staying in a Club room, this is where you’ll be directed to check in from the front-desk, although you’ll need to pick up a key from there to get up to the club floor (level 30) in the lift. 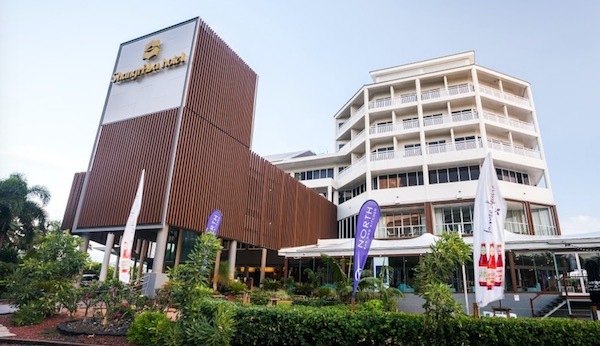 The Club staff handled the welcome and check in formalities, and throughout the whole stay were really on the ball, proactively offering tea, coffee and checking in on guests in a subtle and not over-bearing way. 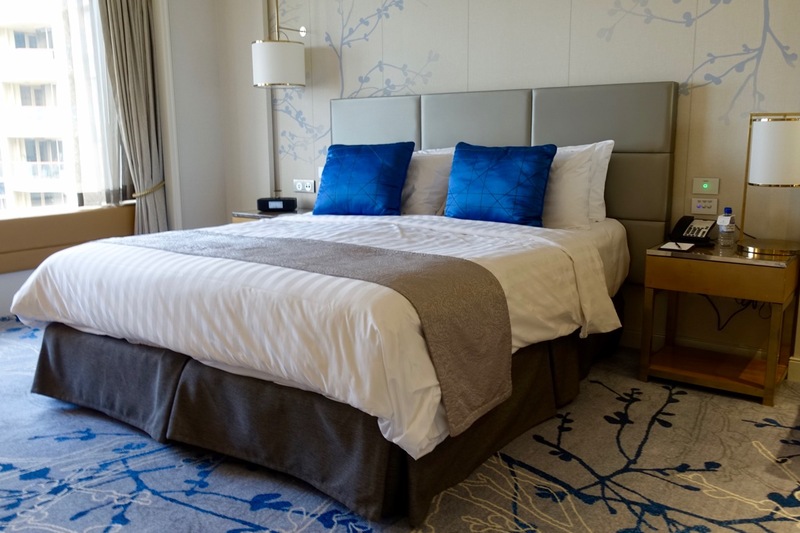 They explained the Fine Hotels & Resorts rate benefits, as well as what was available in the club lounge – see the full list below. 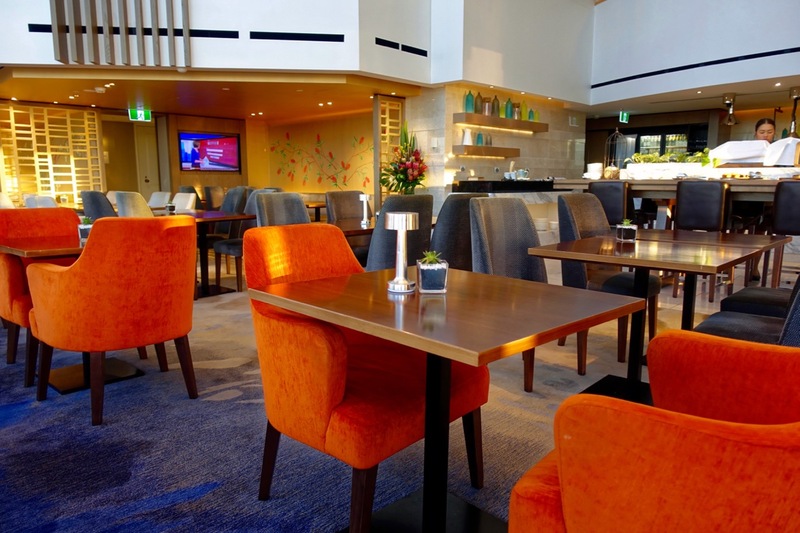 The Horizon Club has two areas, with the largest set space used for casual dining tables with room for 2 to 6 guests. There was plenty of room for guests both at afternoon tea and during breakfast. The afternoon tea service didn’t offer a huge selection, with a plate of sandwiches and several plates of pastries. However all were very good quality and not in short supply. 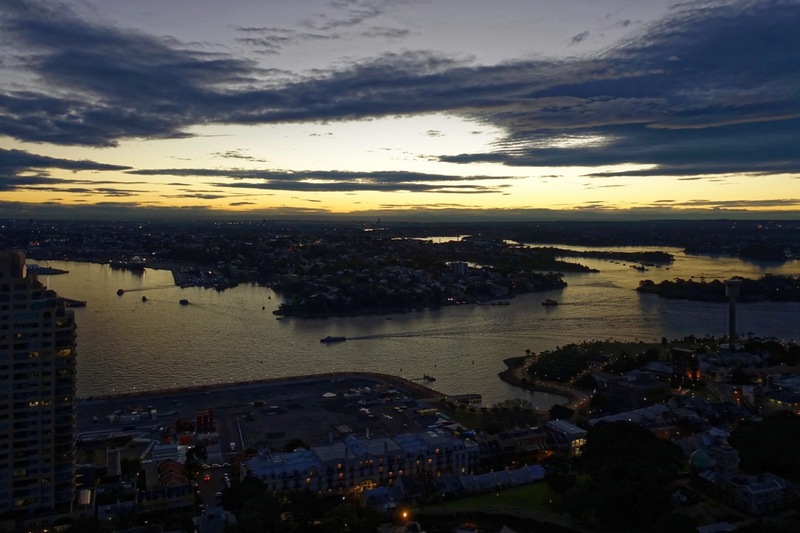 Afternoon tea came with a beautiful sunset, and a chance to pause and take in the Harbour. 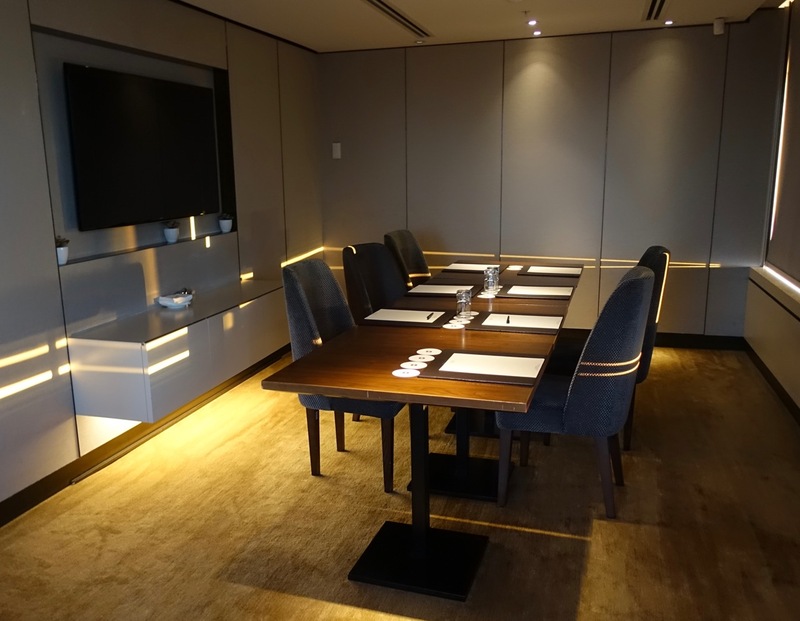 The Horizon Club also offers a boardroom to guests which you can use for meetings for up to an hour. The next morning I decided to take breakfast in the Club instead of in the main restaurant on the first floor, simply because it was such a nice spot. 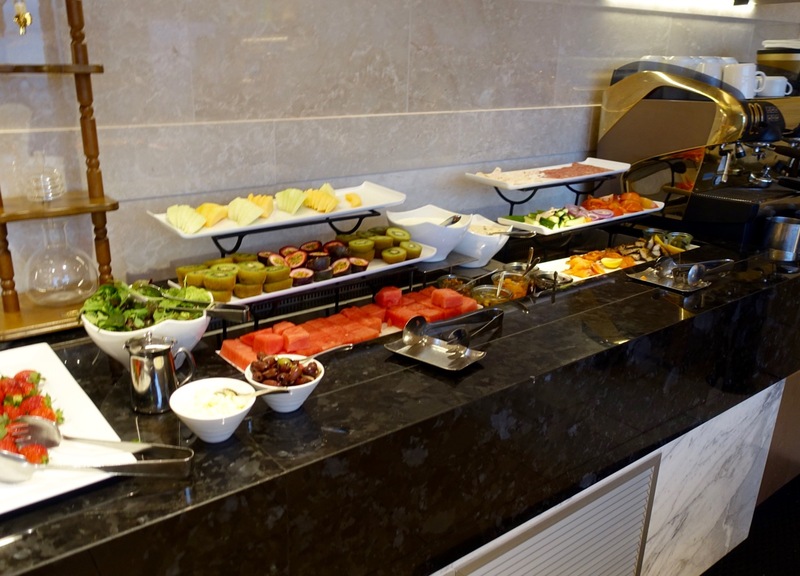 The selection was, I assume, not as good in the Club but there was still an acceptable spread of hot food with toast, bacon, sausages and scrambled eggs, along with pastries, fruit, cold meats and cheese, and some cereal. Staff served Coffee, Tea or Water as requested. 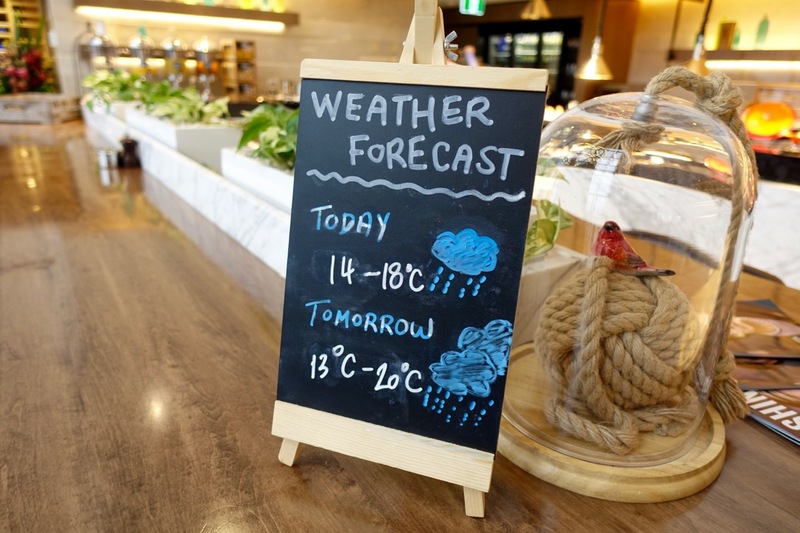 The Club staff were friendly and this weather forecast was a nice touch too. 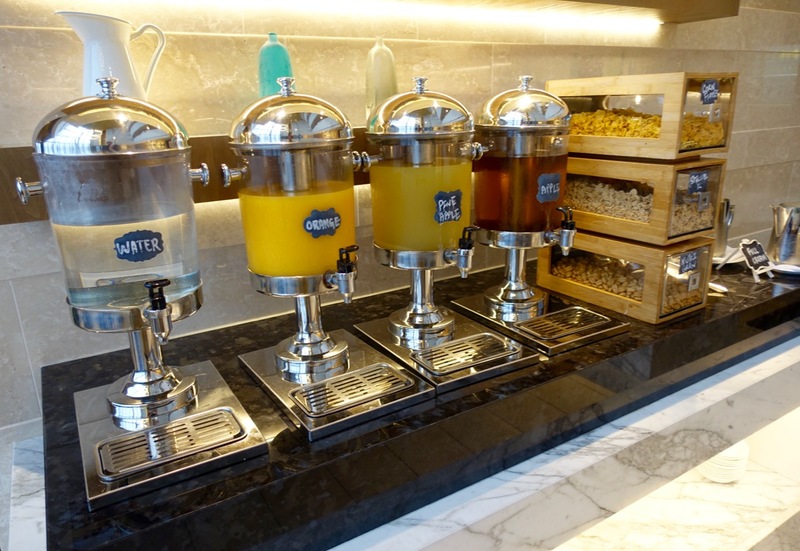 How did I use my Amex Fine Hotels Food & Beverage credit? 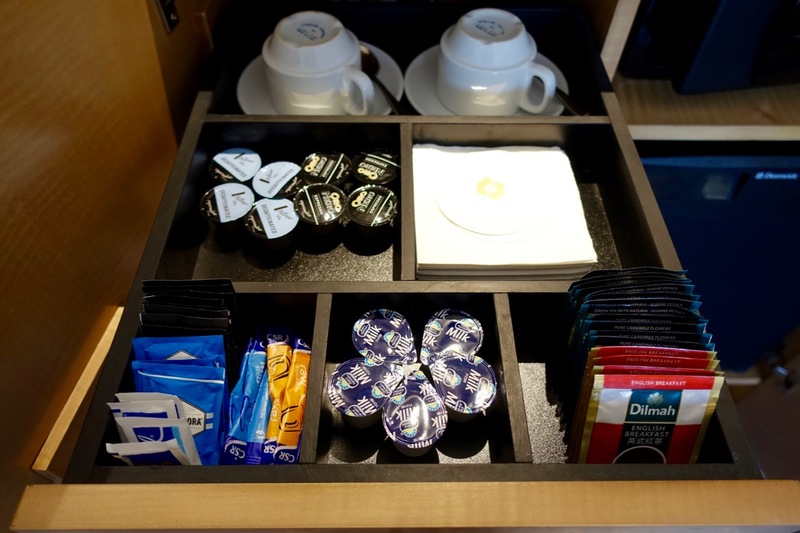 Room service was not usable for the FHR dining credit, so it has to be used in the hotels various restaurants or bar. Firstly, I had a lunch booked in, which we took in the restaurant. 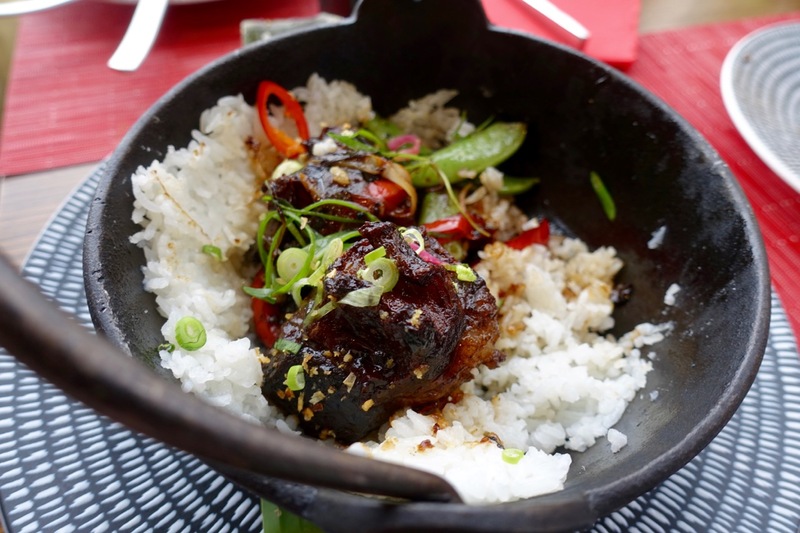 The food was reasonably priced at around $20 to $25 per main. 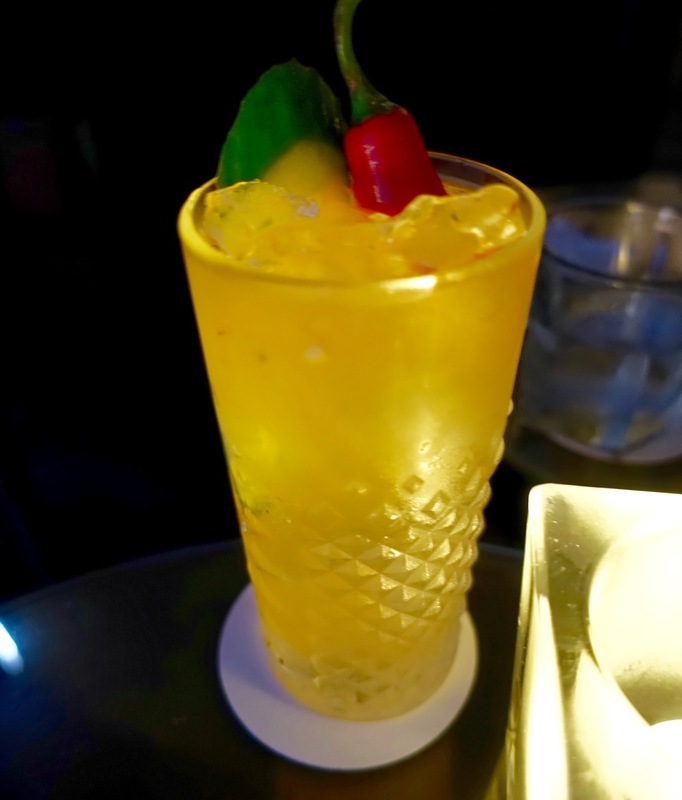 Then I caught up with another friend in the evening for a couple of drinks in the Altitude bar on Level 36. Again, the views were a bit ridiculous. All up I used about $100 AUD out of the $100 USD credit. I could have easily picked up lunch again, but that would have been overkill. Either way, it was an awesome perk. As you can probably tell, I enjoyed the stay here. The room was really comfortable although not huge, whilst the ‘modern Asian’ design of the place still felt contemporary, it also wasn’t anything to make your jaw drop. 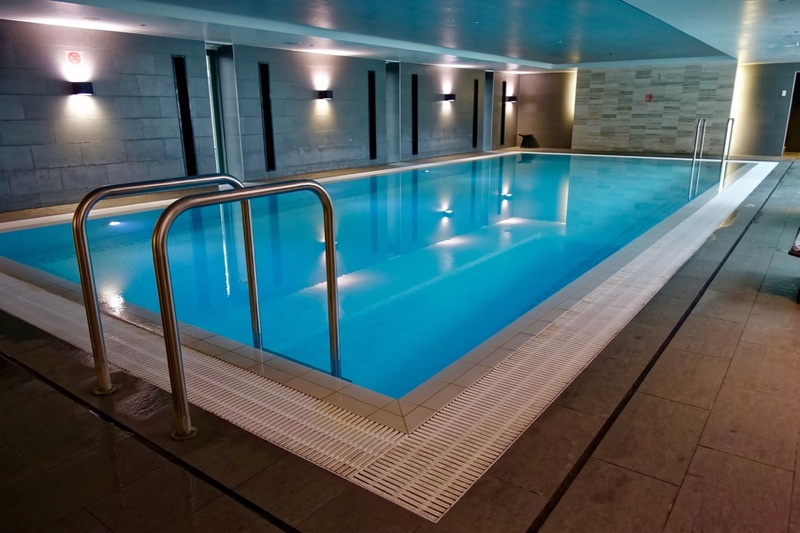 The service from everyone I dealt with was excellent, particularly the Horizon Club staff who were all superb. But as you can expect, it’s the location and height of the place that makes the stay, and access to the Horizon Club really made the stay massive win. Great review. 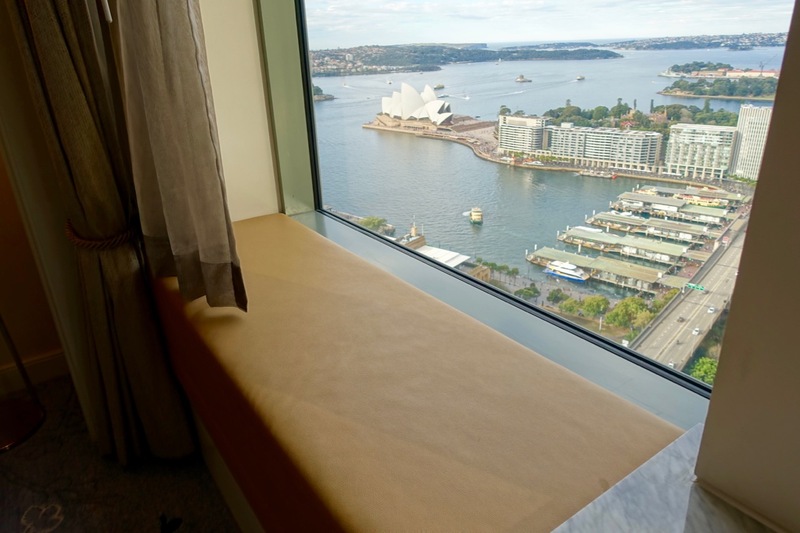 This is one of my favourite Sydney hotels for the reasons you outline. 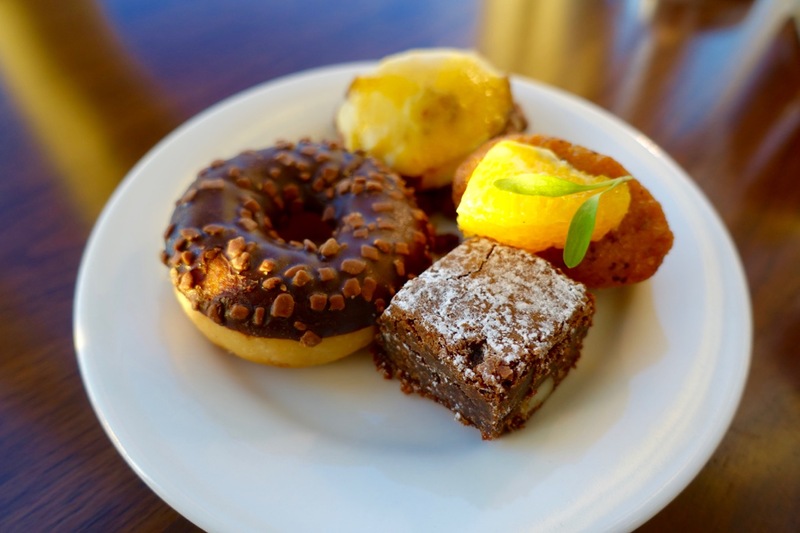 Tip: If in a Horizon Club room, staff said we were welcome to try both breakfasts (on level 2 and level 30), so others should be able to do this too.